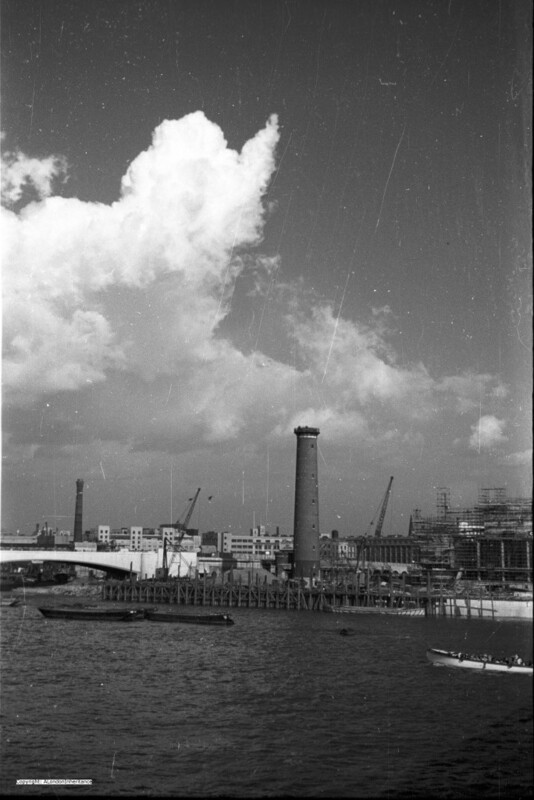 There are some photos from my father’s collection that I was unsure of whether I could find the location where the photo was taken. This week’s post is a typical example of this type of photo, but also how such a simple photo leads into further investigation of the area where the photo was taken. 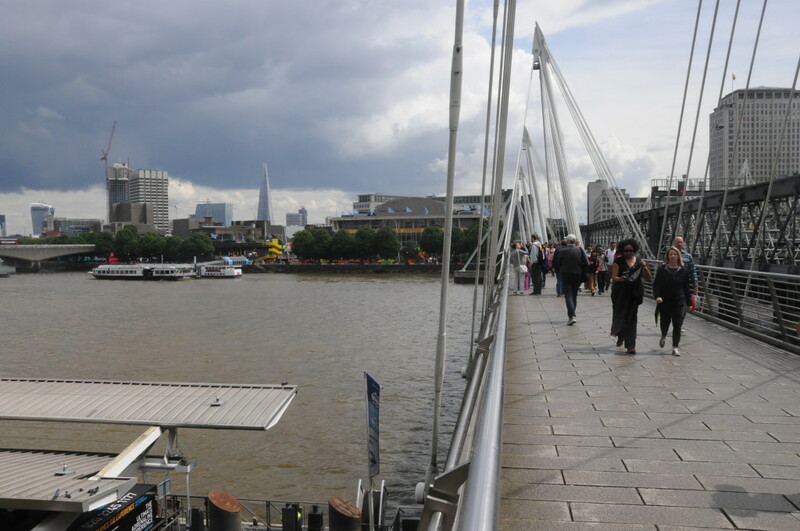 This is what I wanted to get out of this journey, find the location of where all my father’s photos were taken and increase my knowledge of the history of London. 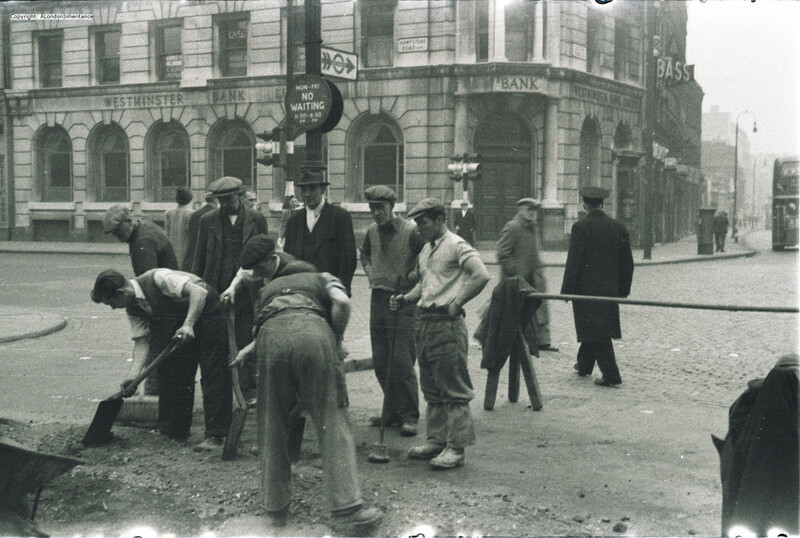 Two very similar photos taken in the late 1940s show a group of men working on the road at a road junction, with a Bank on the corner behind them. There was nothing really to identify the location, however on closer examination of the Bank, there is the street name of Hampstead Road. The name on the sign on the right of the Bank cannot be identified so I could not work out the road junction. The angle and the distance does not allow a name to be resolved. 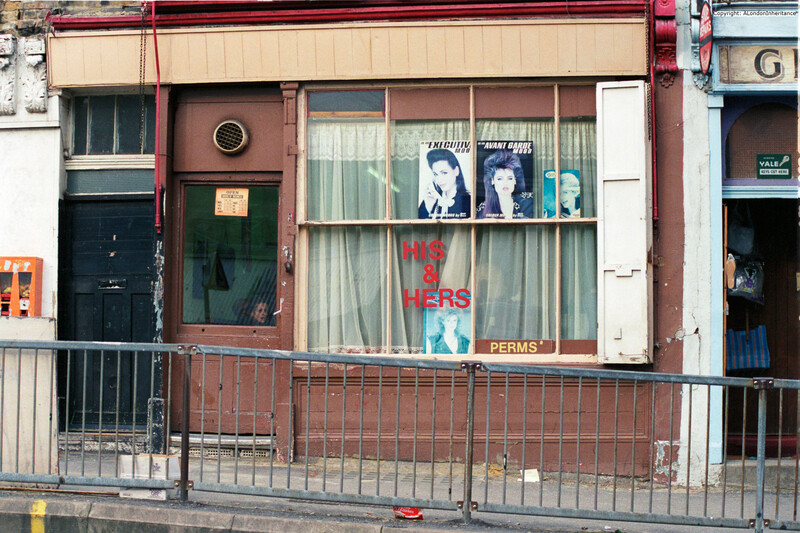 So I knew this was in Hampstead Road on a street corner, but where? 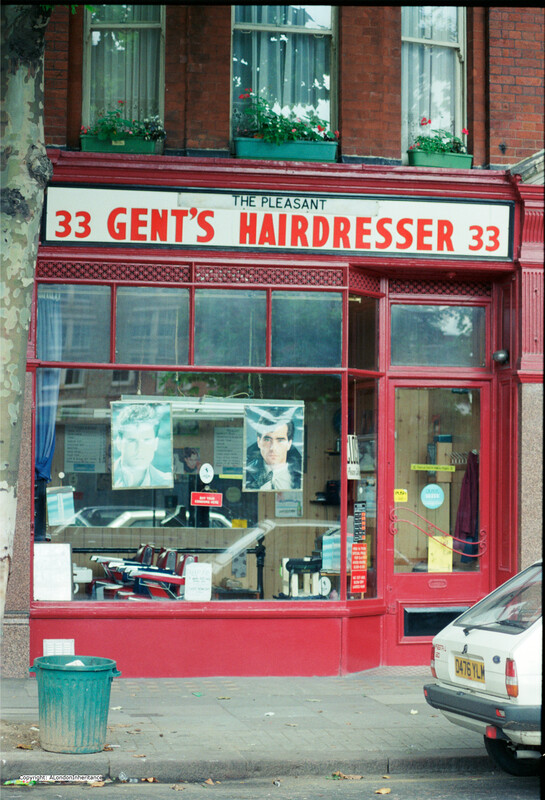 I have walked Hampstead Road before and could find no location that fits these photos. I have a number of sources to search, both written and online to try to find locations and I eventually found the location for this one following a search on the English Heritage website searching for a Bank in Hampstead Road. This resulted in a photo of the same bank, identifying the location as on the corner of Hampstead Road and Euston Road, so now I had the location with the photo being taken outside Warren Street underground station looking across the Euston Road to the Bank on the opposite corner. 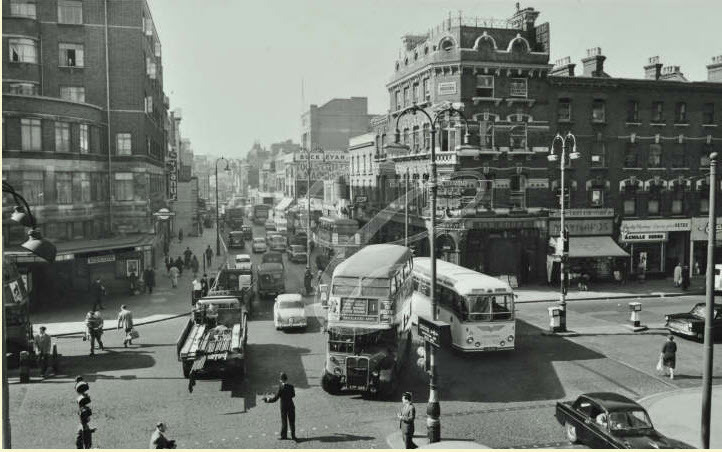 The junction of Euston Road, Hampstead Road and Tottenham Court Road has changed dramatically over the years since this photo was taken. 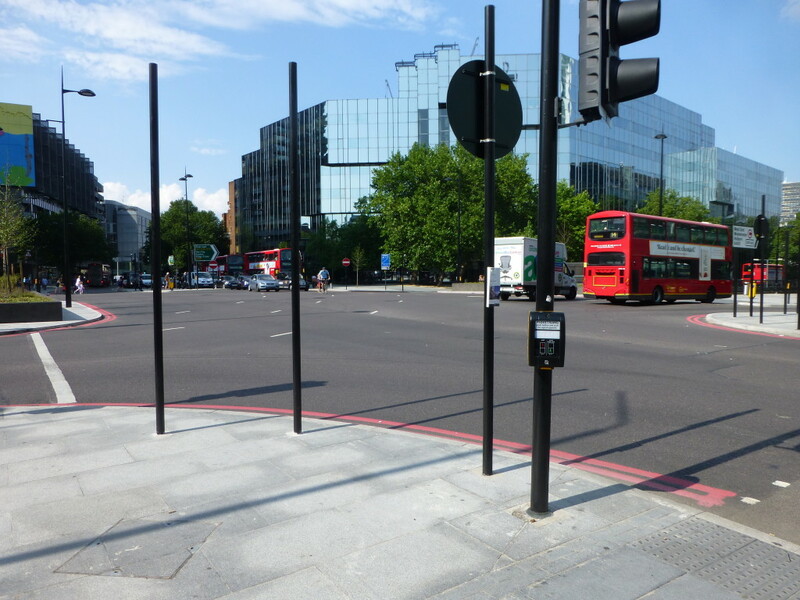 The Euston Road has been considerably widened with the Euston Underpass being constructed to take traffic along the Euston Road under the junction of Tottenham Court Road and Hampstead Road. 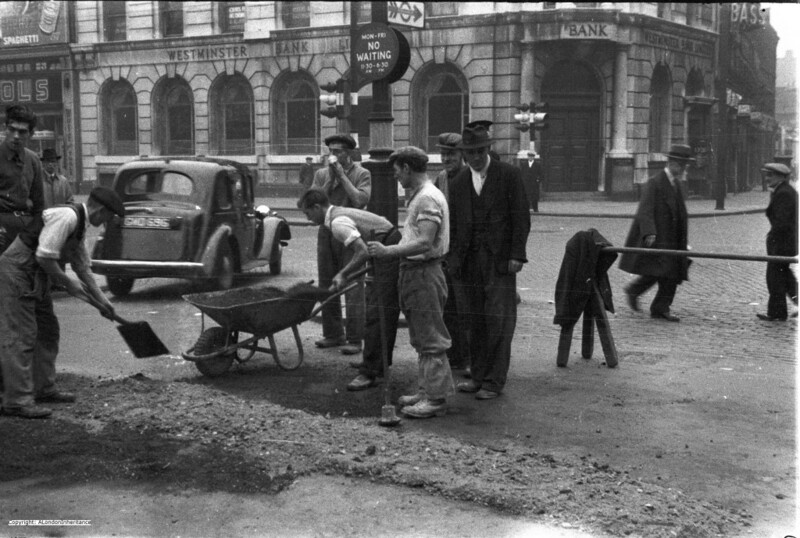 Working along the Euston Road to Great Portland Place underground station shows how the road has been widened at this junction with the road at Great Portland Place being about the original width. There are still many original building on the south side of Euston Road with Warren Street underground station being one of these that has not changed, therefore the south side marks the original alignment of Euston Road. 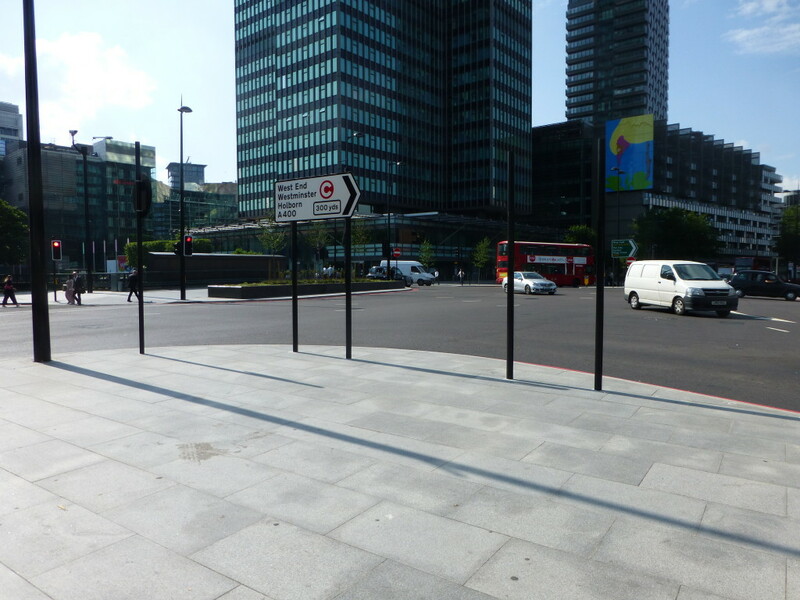 The north side has all been redeveloped with Euston Tower and the more recent Regent’s Place office buildings. My estimation of where the bank was located is therefore half way across the new road, just over the Euston Underpass. There was one point that worried me in confirming the location of this photo, there is an Underground sign pointing east along Euston Road, I would have assumed that if this was outside Warren Street it would be pointing to the station, however a quick check confirmed that in the direction of the sign, a short walk along Euston Road is Euston Square underground station, so this sign was directing travellers emerging from the Northern line at Warren Street to the Circle, Hammersmith and Metropolitan lines at Euston Square. The following is my 2014 photo from roughly the same position outside Warren Street underground station as the original. Very hard to be precise as there has been so much change since the original, and I suspect I should have been more on the current edge of Euston Road slightly to the left. If I have worked out the original road widths correctly then the corner of the Bank in the original photo is roughly where the white truck is in the 2014 photo. Despite the appearance of this road junction and the surrounding areas, as with anywhere in London there is a considerable amount of hidden history to be discovered. 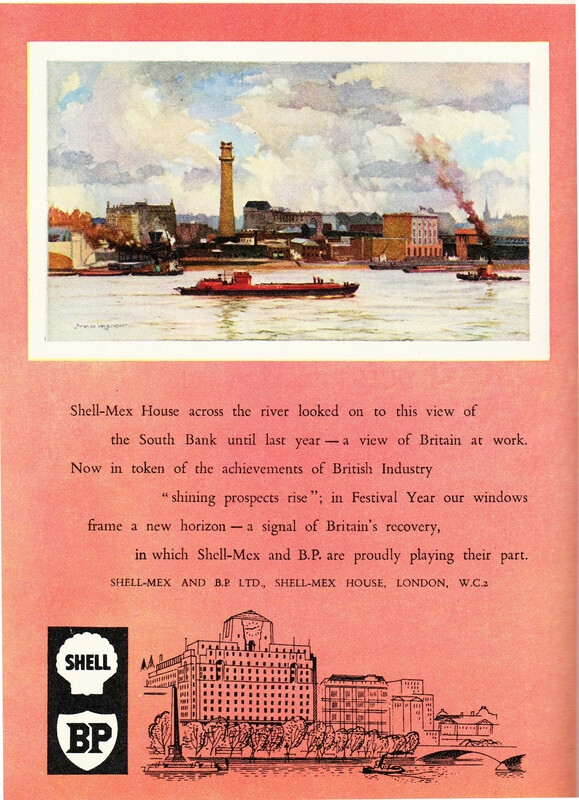 The following map is from the 1940 edition of Bartholomew’s Reference Atlas of Greater London with the red oval covering the area of today’s post. 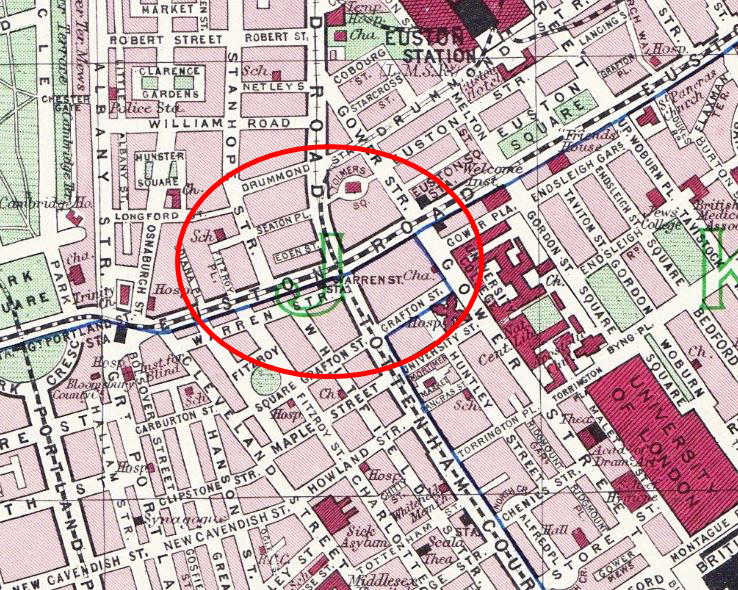 The junction of Tottenham Court Road, Hampstead Road and Euston Road is under the “J” in the centre of the oval. Warren Street station can just be seen and the photo was taken outside looking diagonally across Euston Road. If we cross the Euston Road from Warren Street to the north side we find Euston Tower and the Regent’s Place development. This has completely obliterated Eden Street, Seaton Place, Fitzroy Place, indeed this whole area bounded by Drummond Street and Osnaburgh Street. Eden Place was probably where the front of Euston Tower is now located and was lost in the widening of Euston Road and the construction of the underpass. Seaton Place was probably at the rear of Euston Tower, this is now a pedestrian walkway between Euston Tower and the other office blocks of Regent’s Place which for some reason is called Brock Street. No idea why the original name could not have been retained. 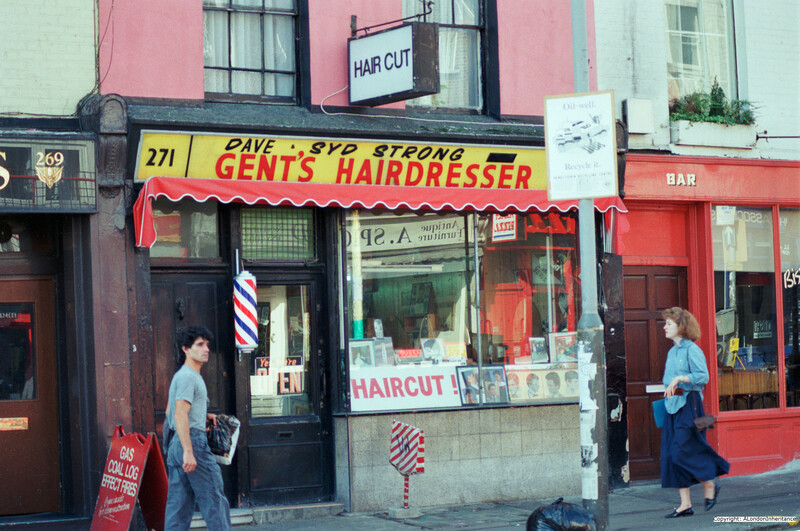 It was on this corner of Hampstead Road where the Adam and Eve Tavern was located. 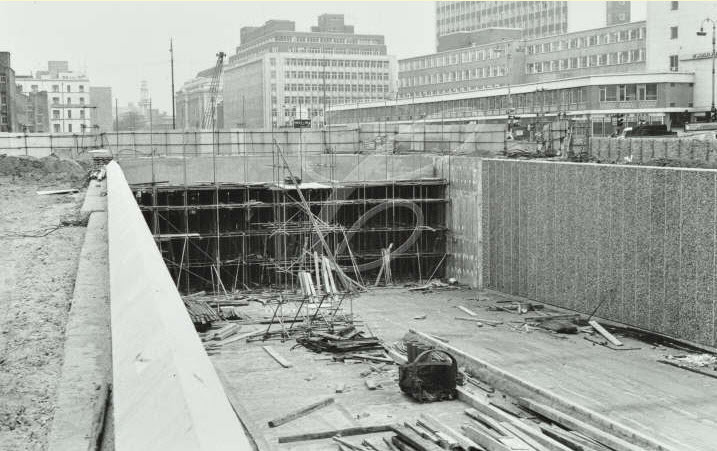 The location now is probably exactly where the underpass dives under the Hampstead Road, Tottenham Court Road junction. 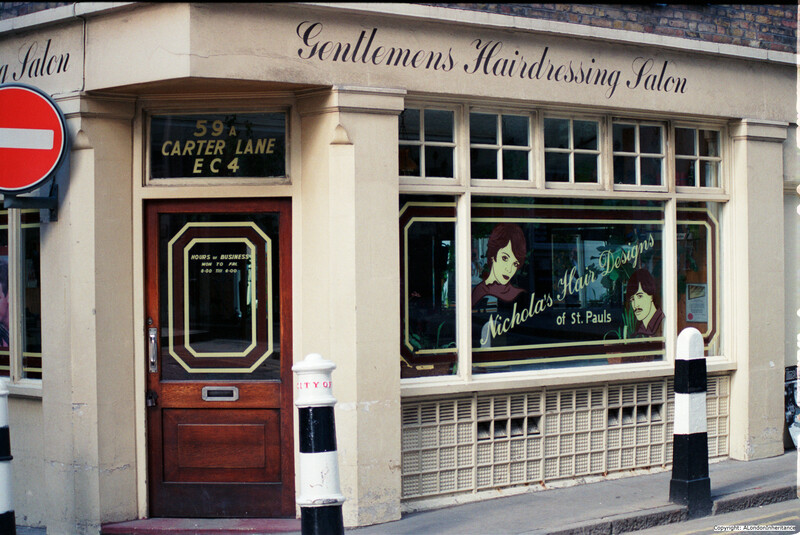 This was built on the original site of the Tottenham Court from which Tottenham Court Road takes its name. The manor was converted to the original Adam and Eve somewhere around 1645. Up until the later part of the 18th century the tavern and extensive gardens were very popular with Londoners. 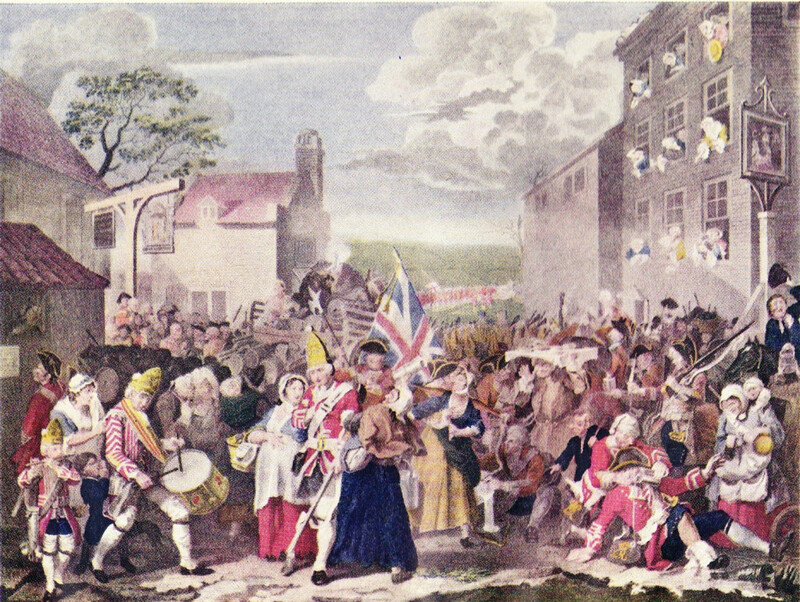 In the road outside the Adam and Eve, Hogarth set the scene for his “March to Finchley” where a military camp had been set-up and the picture shows the disorderly Guards in true Hogarth style on their way to the Finchley Camp as part of the journey to Scotland to meet the Jacobite Pretender (Charles Stuart). The Hogarth picture shows two Taverns with the Adam and Eve on the left and the Old Kings Head is on the right. 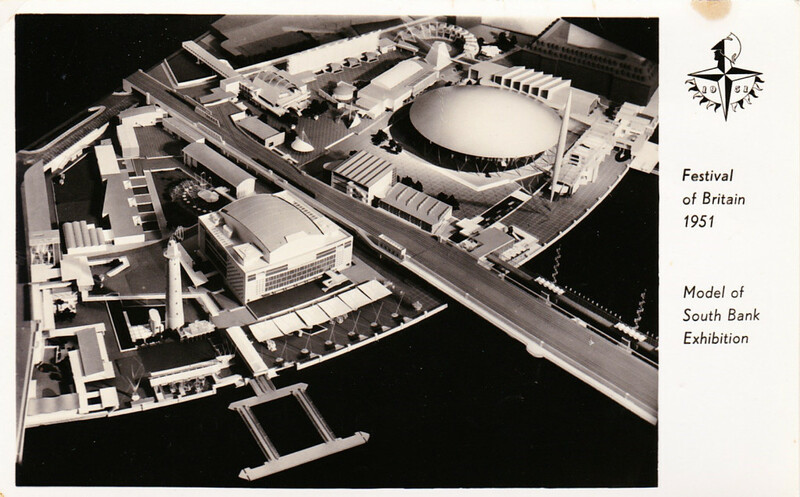 Strange to think that the Euston Underpass is now running left to right across this picture. The King’s Head was demolished in 1906 to make way for the widening of the Hampstead Road. The very narrow road width of the junction at this point had long been a problem as the King’s Head jutted out into the thoroughfare and calls had been made to address this from the start of the nineteenth century. I took the following photo on the east side of Tottenham Court Road looking over towards Euston Tower and Regent’s Place. The Adam and Eve Tavern was roughly where the red traffic lights are now located with Eden Street just in front of Euston Tower. The following photo is the second of the same scene. It is fascinating to compare working conditions of the late 1940s with those of today. Not a single high visibility jacket or traffic cone in sight. 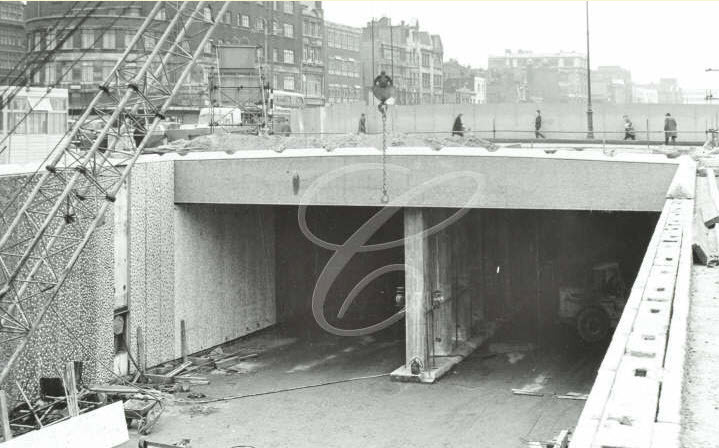 I have recently received some fantastic photos of the Euston Road, Hampstead Road junction and the building of the underpass from John Cinnamond. They show the junction before the widening of the Euston Road and the building of the Underpass. The first photo, taken in 1961, is looking east along Euston Road. The bank on the left of the photo is the same as the one in my father’s photo, however this now shows the full view of the road. 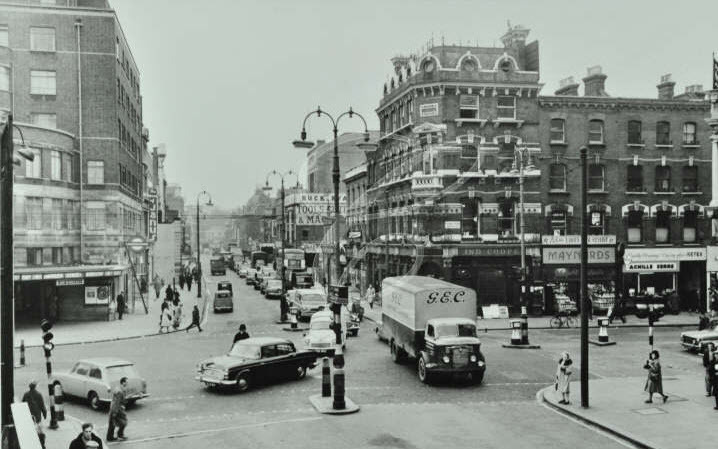 The next photo, also taken in 1961 is looking west along Euston Road. Warren Street Underground Station is on the left and this is basically the same today, however the very significant change is to the right of the photo. The pub on the corner is the Adam and Eve. 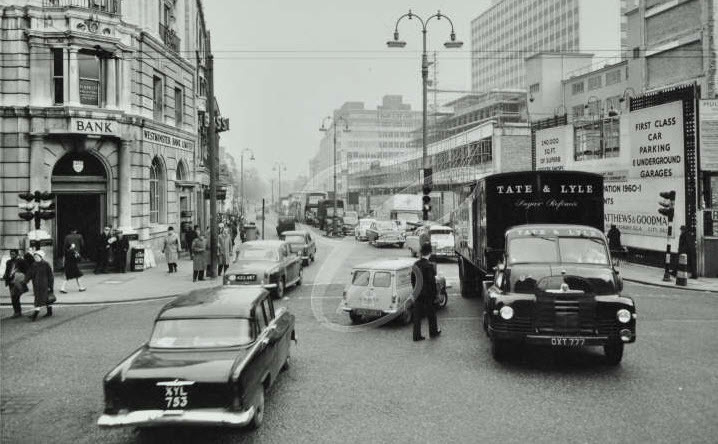 All the buildings on the right of this photo were pulled down in order to make way for the widening of the Euston Road and the Euston Underpass. Where the buildings on the right, facing the camera stood, is now the underpass and a bridge over the underpass leading to the north side of Euston Road. I have repeated one of my photos from earlier in the post. This is looking across to where the pub and the buildings running to the right in the photo above used to stand. Now we come to the building of the Underpass. 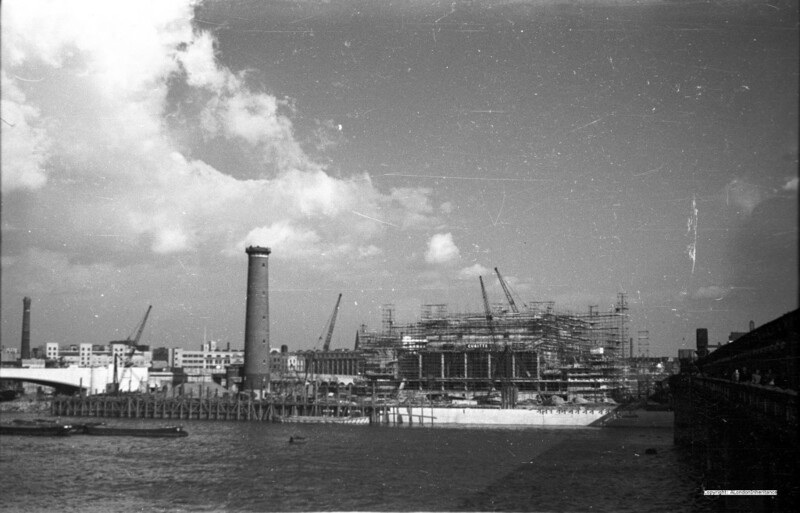 These photos were taken in 1966 and this is looking across to Warren Street Underground station, the curved building to the left of the photo. 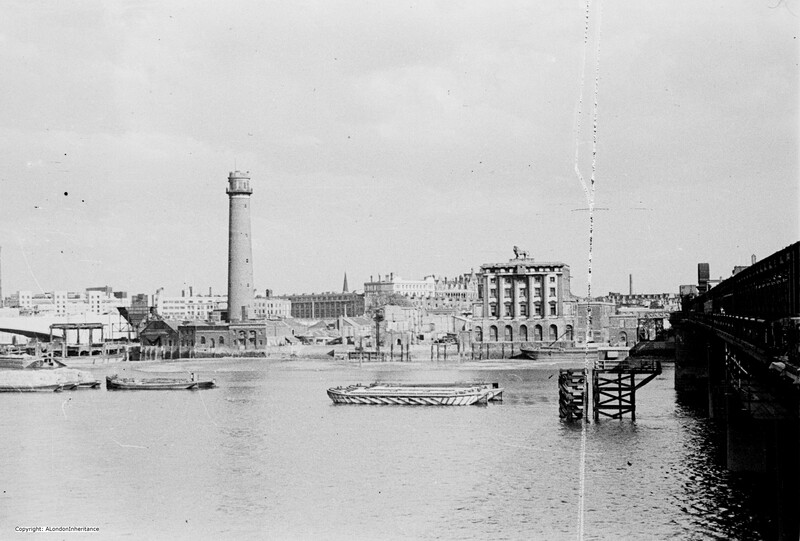 The pub and buildings in the early photos ran across to the right, where the hoarding can be seen, but have now been pulled down and the Underpass is being built. And looking in an easterly direction, the Underpass is where the bank used to stand, which would have been roughly left of centre, slightly set back from where the Underpass goes under the road. 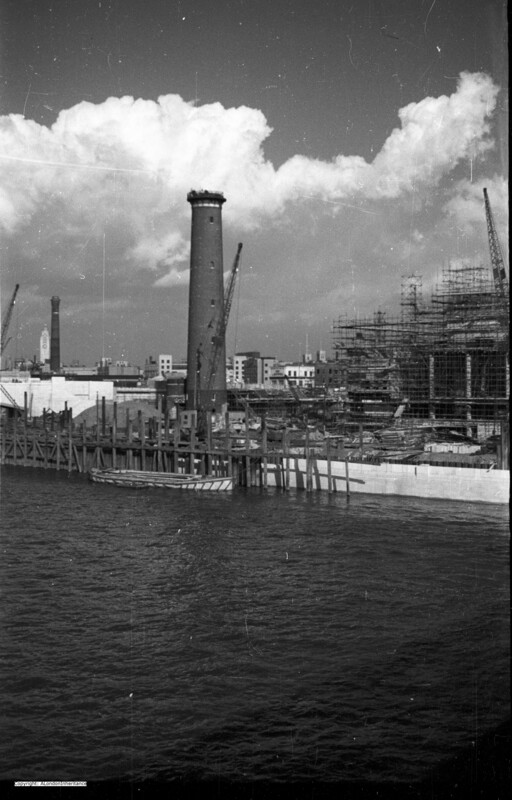 One final photo which again is from 1961 and is looking to the west. The lorry is from the company G.E.C. the engineering and electrical conglomerate that failed so spectacularly after trying to turn itself into an internet / communications business at the height of the dot-com bubble. 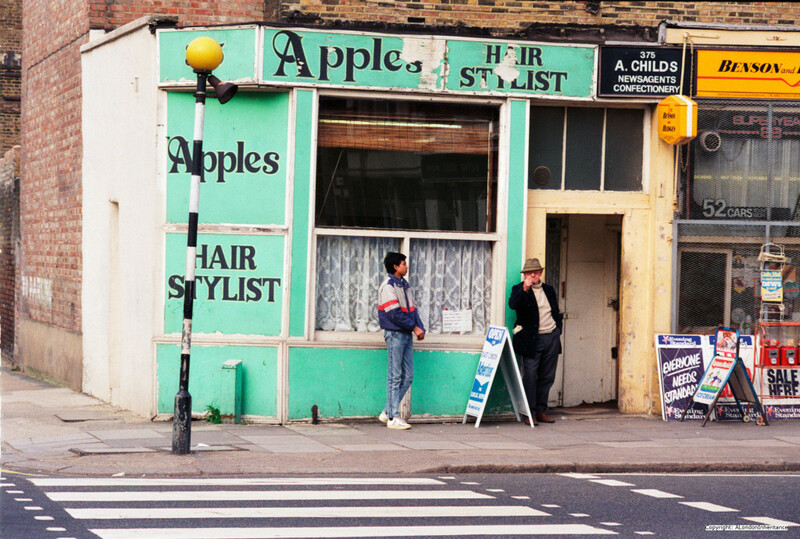 Interesting not only how the urban landscape changes, but also the businesses operating in that landscape. An amazing series of photos and I am very grateful to John for sending and letting me include in the post as they complete the story of how this road junction has changed so considerably. So, one simple road junction in London, but as with most places across London, a fascinating history. This entry was posted in London Streets on July 27, 2014 by admin. This time of year (if you ignore the recent thunderstorms over London and the vagaries of the British weather) is the ideal time for a Garden Party and what could be better than sharing that Garden Party with your favourite British and visiting American Film Stars. This was an event where you could meet your favourite Film Star and build an autograph collection or get a photo, as well as raising money for the NSPCC and the Church of England’s Children Society. 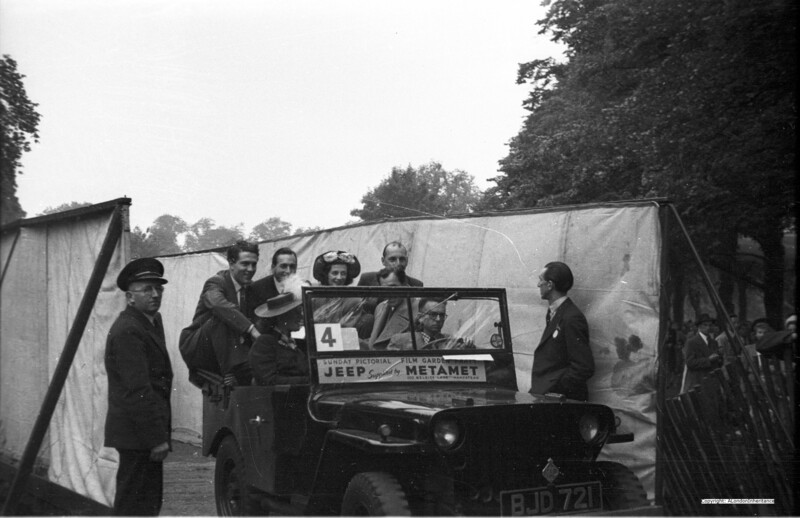 These are a series of photos taken by my father at the Garden Party at the point where the Stars would enter the garden on a Jeep, and be driven round from stall to stall where you could queue to meet the Star and collect an autograph or a photo. 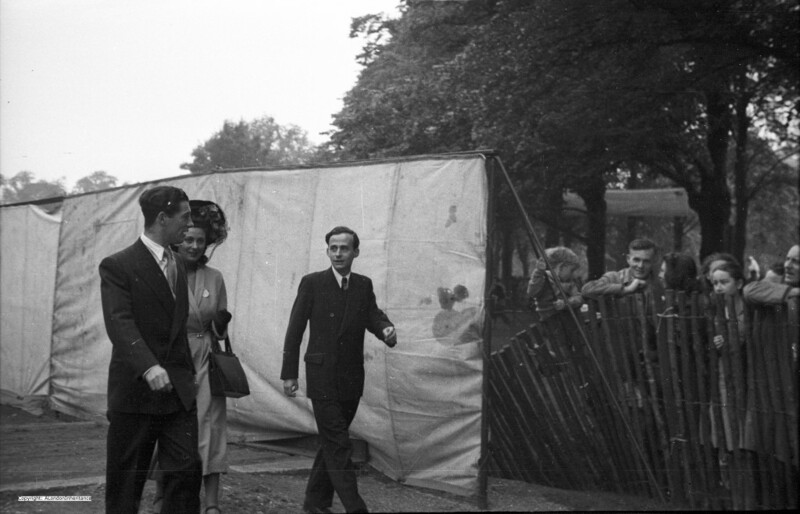 Despite trying to identify the Film Stars in each of the photos, I have not had any luck. Some possibles but I do not want to name them until I can be sure. Any feedback with names would be appreciated. 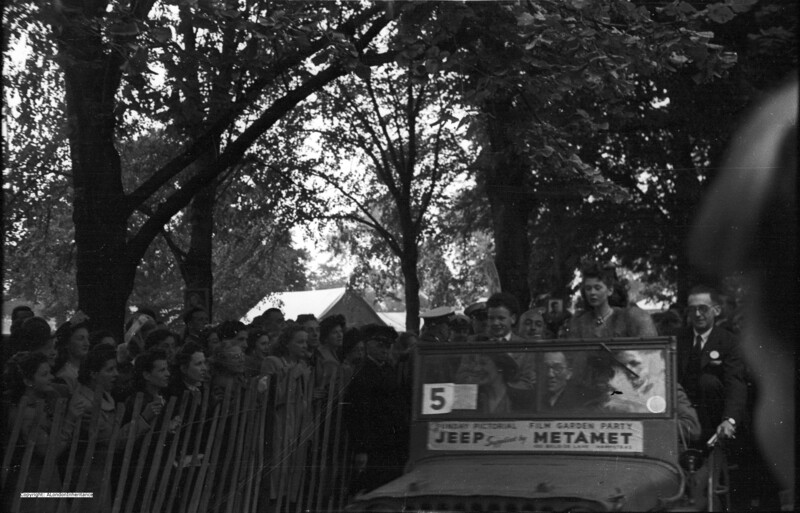 The following photo shows one of the Jeeps emerging from the Stars entrance to the Garden Party and shows the glamour and excitement created for the waiting crowds as each Jeep would emerge with a new set of Film Stars. 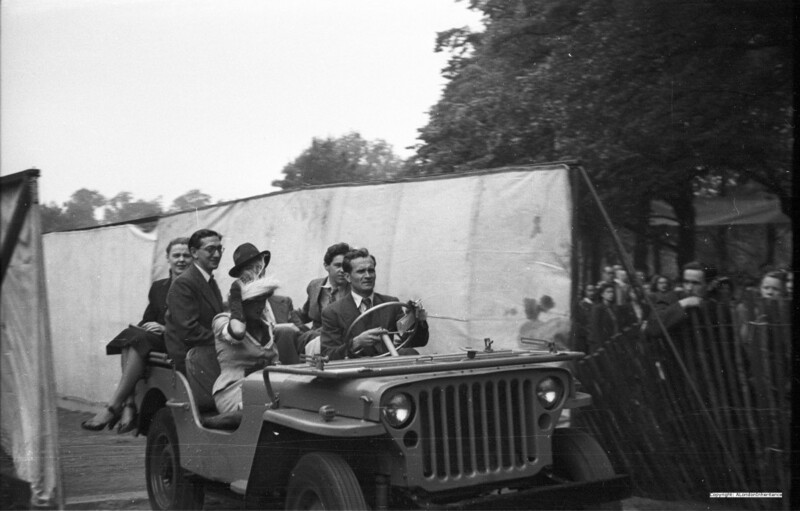 The Stars packed into a Jeep including standing on the edge and balancing on the bonnet. 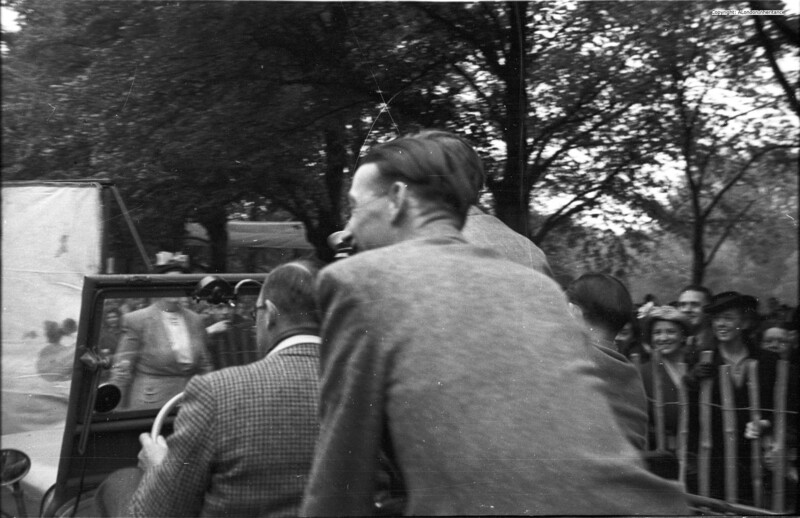 A very nervous man with a camera perched somewhat precariously on the very front, the eager crowd looking to see who would be entering and who they could recognise. 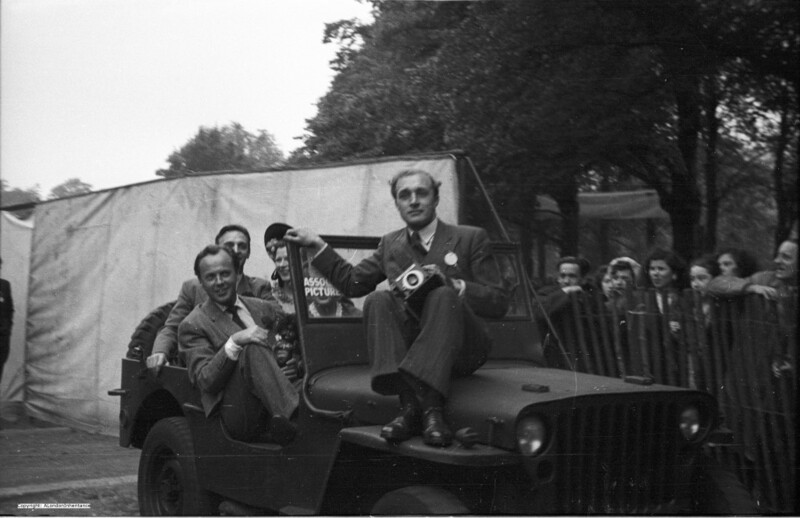 The Associated Pictures on the front windscreens of the Jeeps in the above and below photos shows that these were Film Stars from the Associated British Picture Co rporation. 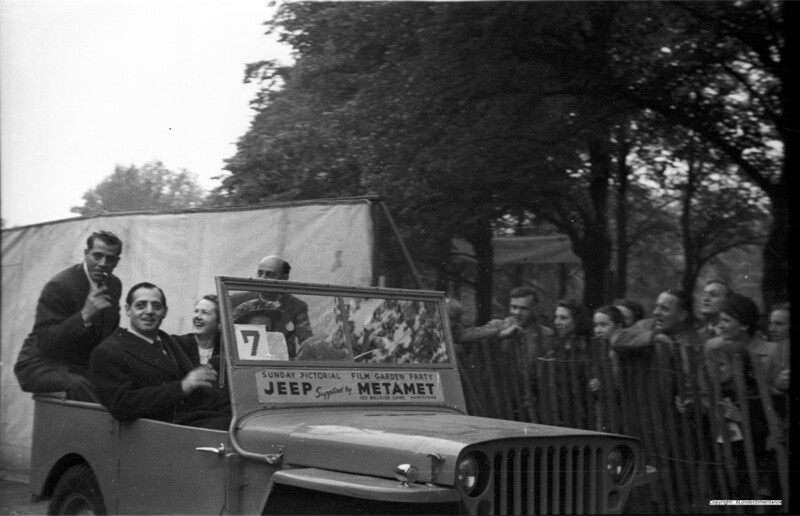 Although in the following photo the Jeep has just passed, look at the faces of the people on the right of the photo. The excitement of recognising someone who up to now you have only seen on the big screen (this was in the days before the Television was a common part of the home and the cinema was still the main source of entertainment). Perhaps they had run out of Jeeps? There are some superb newsreels from British Pathe covering these Garden Parties. A good example being found here. 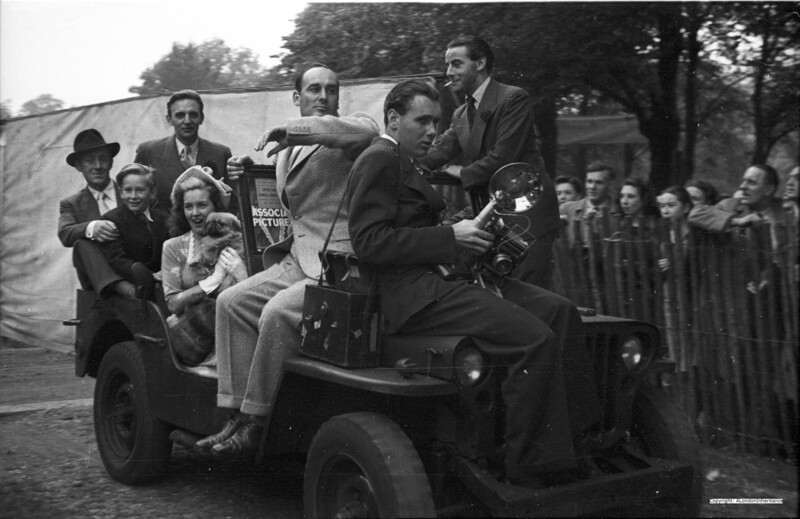 So, if you visit Morden Hall Park one weekend this summer, this is the type of event it was hosting over sixty years ago and you would be one of 25,000 other people all looking to get an autograph or photo with their favourite Star. And if you recognise any of the Film Stars in the photos I would really appreciate a comment or e-mail so I can put names to the photos. This entry was posted in Events and Ceremonies on July 20, 2014 by admin. The first photo is of Ron’s Gents Hairdressers – 27 Three Colts Lane, Bethnal Green, E2. 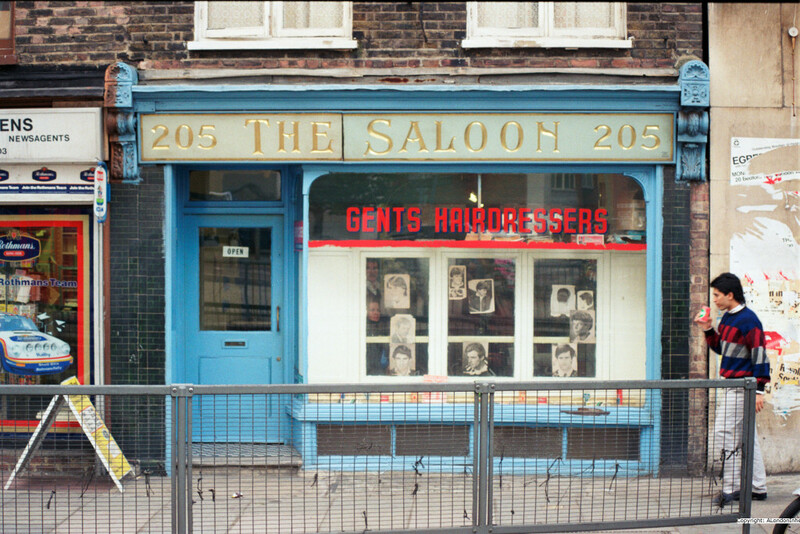 After almost 30 years, this building is still there, but has changed from a Hairdressers to a Barbers, fascinating that the same type of business has been operating in this location for many decades as Ron’s had obviously been long established in 1985. The perfect location for an “Executive Mood” or “Avant Garde Mood” hairstyle. 1980s “big hair”. 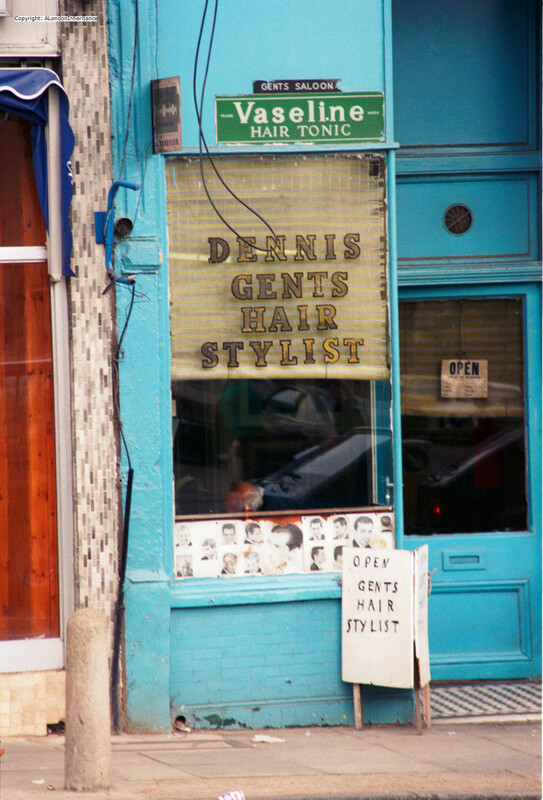 Dennis Gents Hair Stylist. 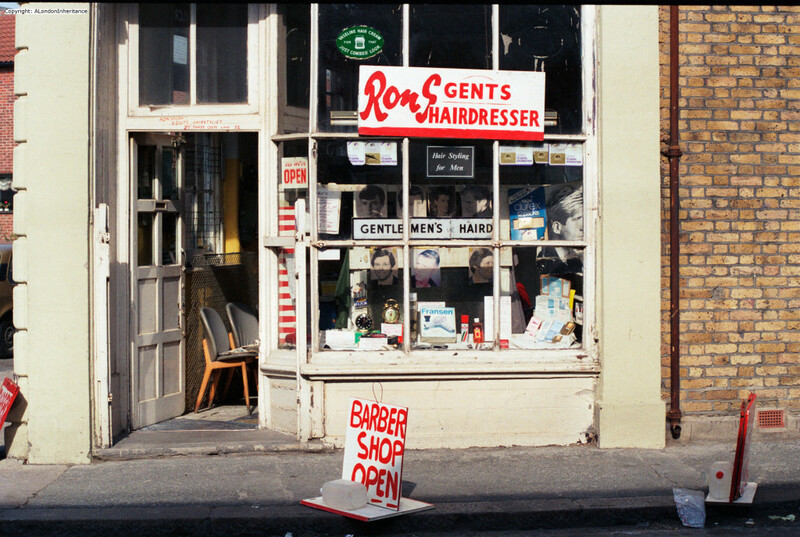 Note the razor blade advertising sign, the long term association between barbers and shaving. 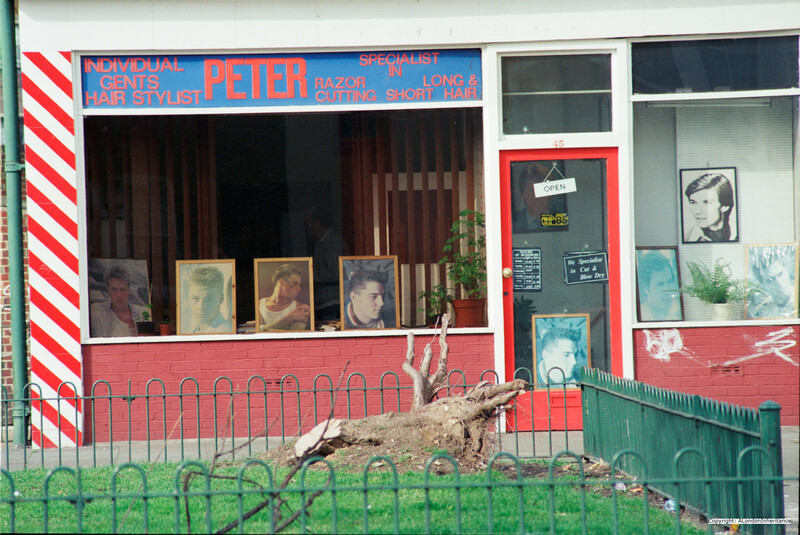 Peter Individual Gents Hair Stylist. Again with model photos in the window. The painting of the wall to the left of the shop continues the association of red and white stripes with barbers. This is more usually seen as red and white stripes around a pole and symbolises bloody bandages wrapped around a pole when barbers also performed surgery, blood letting, the use of leaches and teeth extractions. 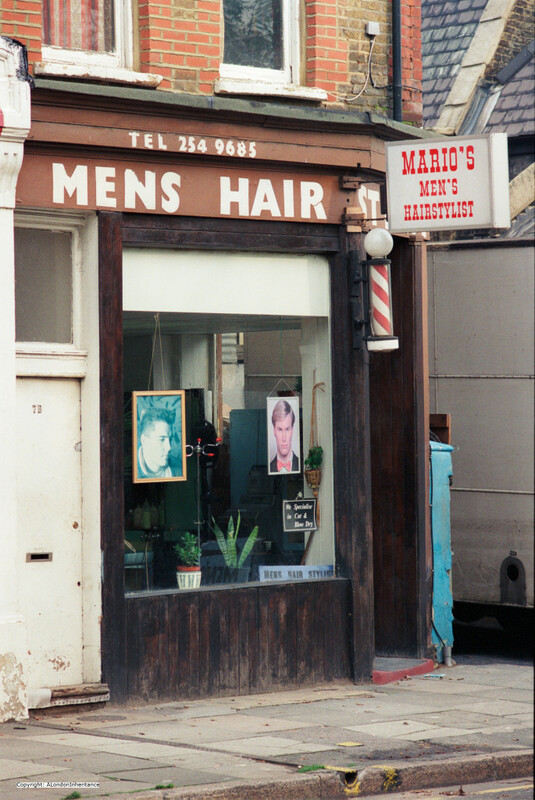 Mario’s Men’s Hairstylist. With the traditional red and white pole. 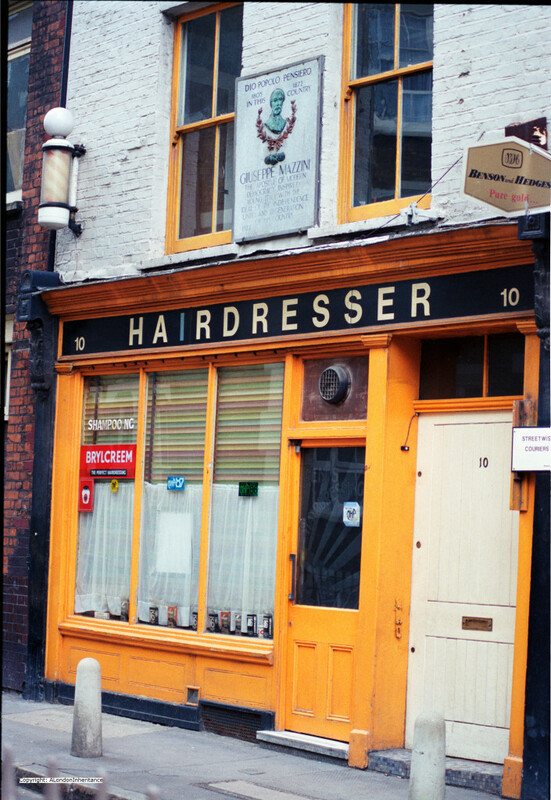 Hairdresser at 10 Laystall Street, EC1 with plaque commemorating Giuseppe Mazzini “the apostle of modern democracy inspired young Italy with the ideal of independence unity and regeneration of his country. ” I am not sure why this plaque is on this building, when he was in London he lived at 183 Gower Street where there is a London County Council Blue Plaque. 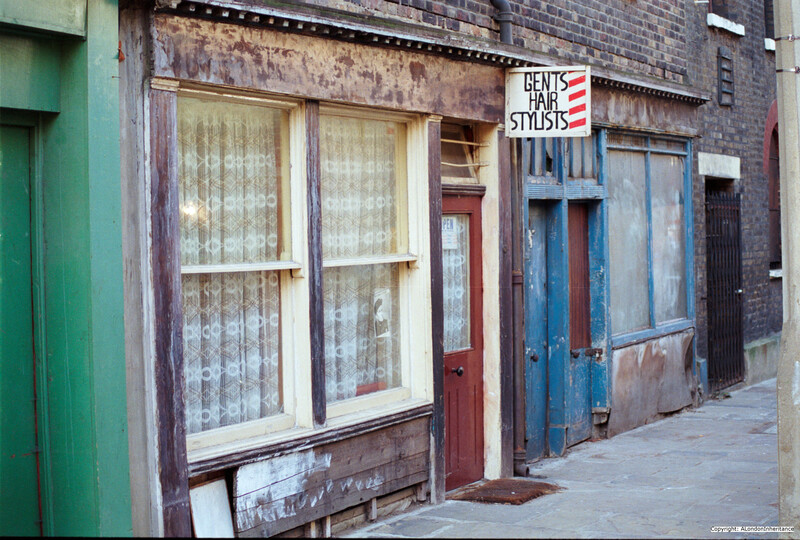 The plaque is still there, although the hairdresser is long gone. 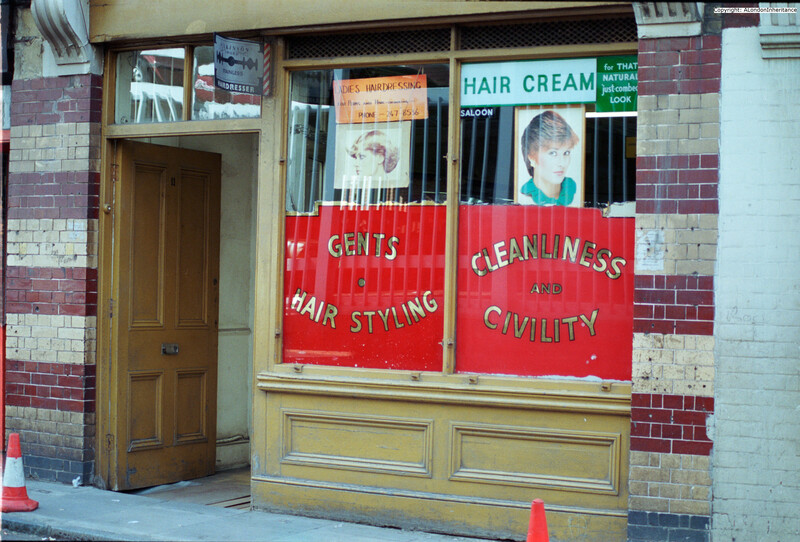 Gentlemen’s Hairdressing Salon, 59a Carter Lane EC4 (central London). 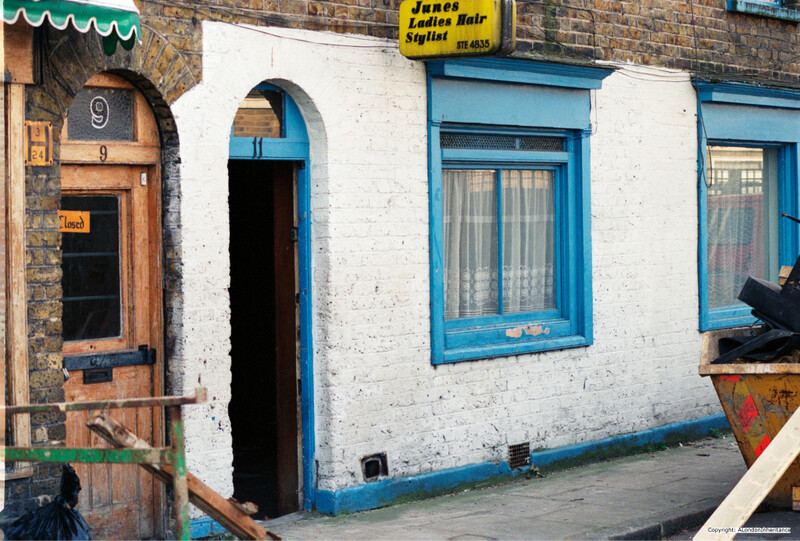 The building is still there as are the same bollards, however the building is now a coffee shop. Junes Ladies Hair Stylist. Closed and being cleared. Note on the sign the old London telephone number format with the area name rather than number. STE was the code for Stepney Green. Letters were replaced by numbers around 1966. This entry was posted in London Streets on July 6, 2014 by admin.